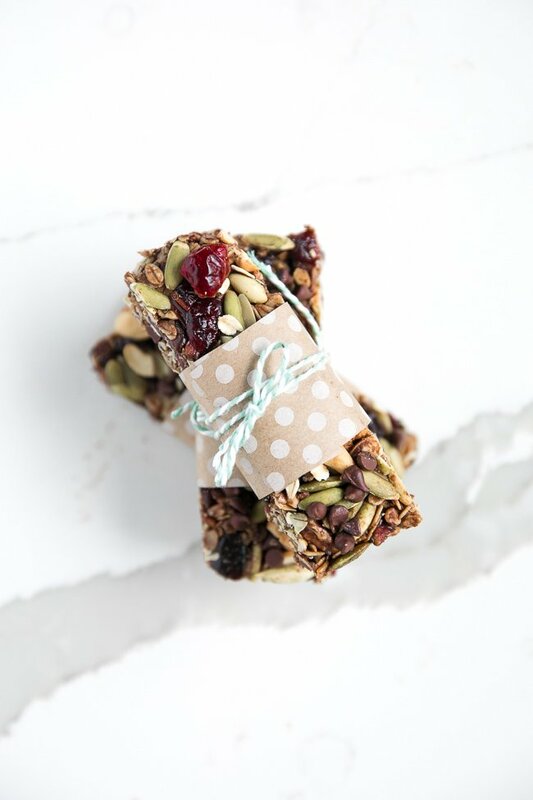 Packed full of nuts, seeds, dried fruit and mini chocolate chips, these Easy Homemade Pumpkin Spice Cranberry Granola Bars are easily customizable and make fantastic holiday edible gifts. Hey, I Wash You Dry readers! 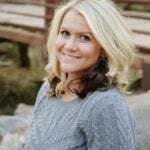 I’m Jessica from the blog Coffee & Crayons and I’m here today to share with you one of my favorite quick and easy homemade snacks- Pumpkin Spice Cranberry Granola Bars! Ok, so I know I’m not reinventing the wheel here; after all, I was eating granola bars in my lunchbox (well) over two decades ago. 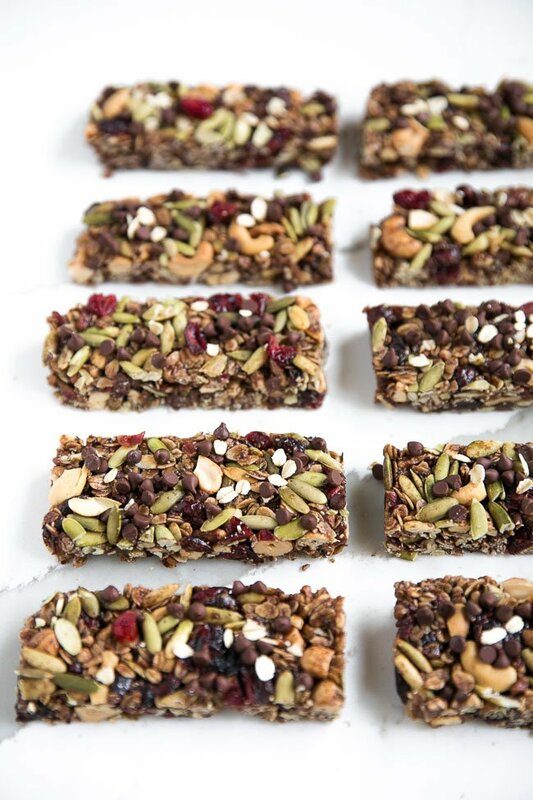 However, I am new to the granola-bar-making club since I was always too chicken to make my own. You guys, don’t be like me. 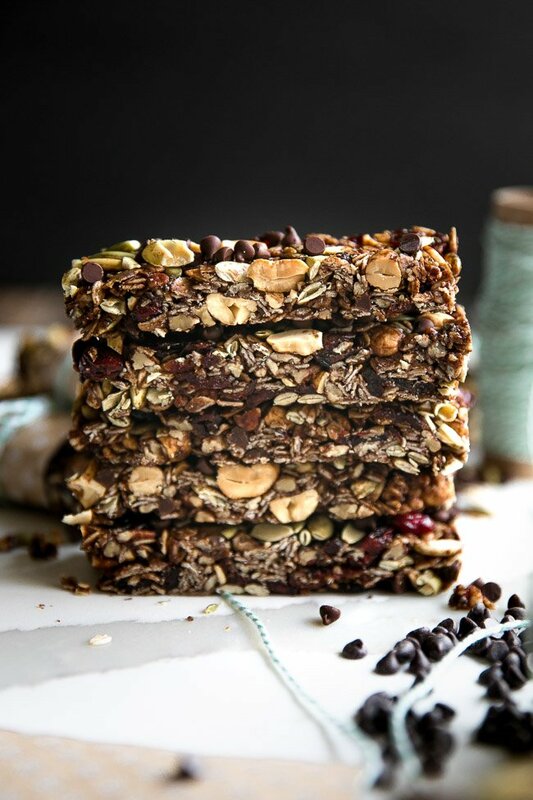 Homemade Granola Bars are so super easy! 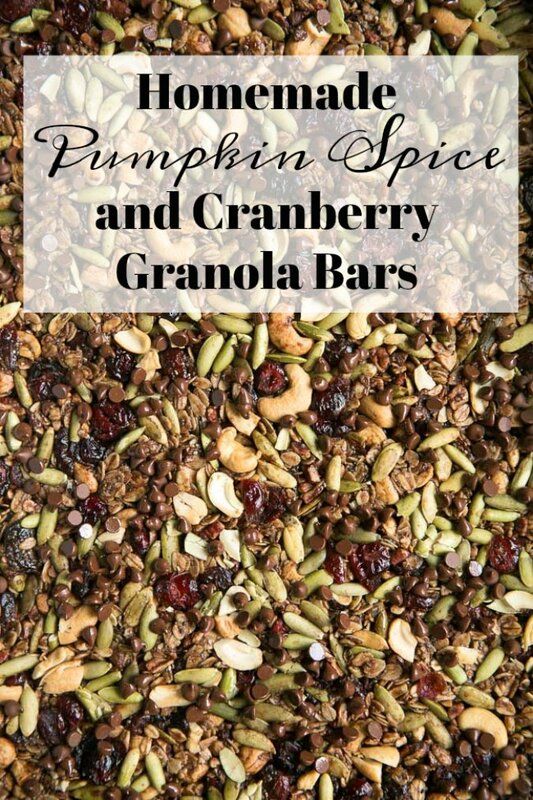 Given that the holidays are rapidly approaching and pumpkin spice is in the air, I decided to make these granola bars festive by spicing them with all the flavors of fall. You can, of course, pick and choose your favorites. The same customization applies to nut, seed and dried fruit choice. But don’t worry, I didn’t forget the chocolate. I added fun mini chocolate chips, but chocolate chunks would also work well. Of course, these granola bars do not have to have chocolate, but the chocolate reminds me of my childhood and that makes me pretty darn happy. Plus, it’s chocolate. I never say no to chocolate. 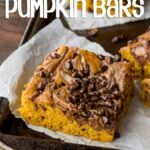 There’s something else that’s pretty awesome about these homemade pumpkin spice granola bars- they make AWESOME edible gifts. 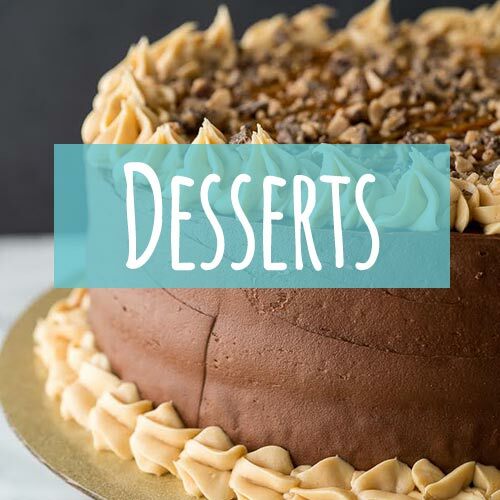 I don’t know about you guys, but I’m always wondering what to give my sons teachers or neighbors for the holidays and edible gifts make it so easy (and much more affordable!) These delicious little guys are not only easy to prepare, but they’re also easy to prepare in bulk. Preheat oven to 350 degrees F. Line a large baking sheet with parchment paper. Spread the oats in an even later on the baking sheet and toast for 10-12 minutes. 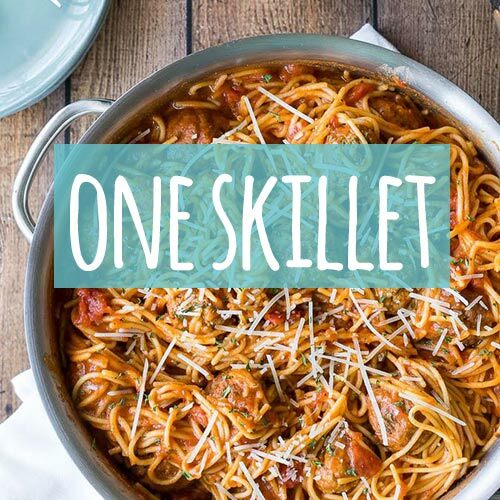 When finished roasting, remove the oats from the oven and reduce oven temperature to 300 degrees F.
Meanwhile, line 9″x13″ cake pan with parchment paper and spray lightly with non-stick cooking spray. Set aside. In a large mixing bowl combine the oats, pecans, cashews, pepitas, cranberries, cherries, flax seeds and chia seeds. Set aside. In a small mixing bowl mix together the ground cinnamon, ginger, nutmeg, cloves and salt. Set aside. With everything ready, heat a small saucepan over medium heat. Melt the butter and stir in the honey and brown sugar, stirring constantly until the sugar has dissolved completely. Stirring constantly add the vanilla and spice mixture and remove from heat. Stir in 1/2 cup chocolate chips (reserving the remaining 1 cup). Pour the honey and butter mixture over the oat and nut mixture and stir well until fully combined and coated (approximately 2-3 minutes). Add the remaining mini chocolate chips and stir again. 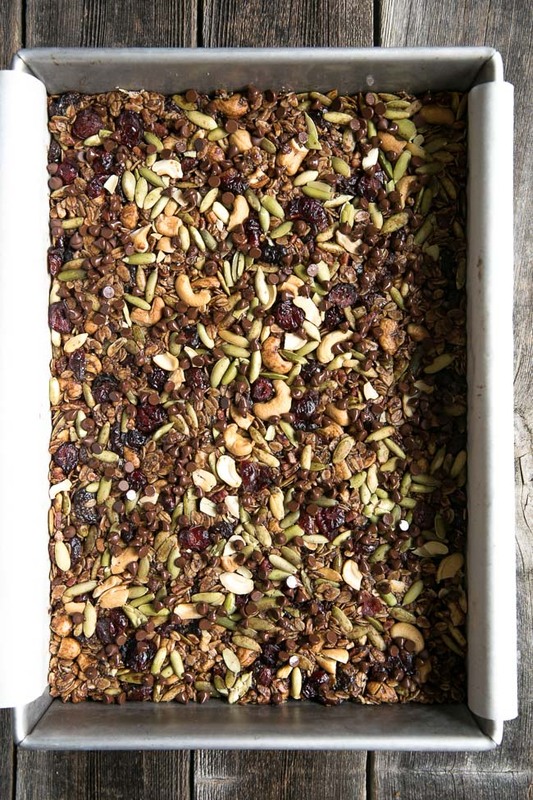 Pour the granola mixture into the prepared cake pan and spread evenly. Press the granola mixture firmly down into the pan and transfer to the oven. Bake for 25-30 minutes or until light and golden. 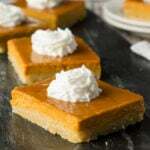 Remove from the oven and allow mixture to cool before covering with foil and transferring to the refrigerator to cool and solidify (at least 2-4 hours). 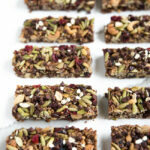 Gently lift the granola bars from the pan with the parchment paper and cut into desired number of bars. Store in an airtight container for up to 5 days. Great recipe. We used cranberries, chocolate chips and pecans. Mine were a bit thinner than yours, but that didn’t matter. They turned out great! 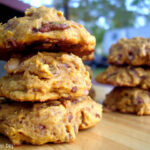 A flawlessly perfect recipe!!! Huge hit at our house love it ! I love that you added ginger. I might add crystalized ginger too!